Previous MasterChef champions Thomasina Miers (2005) and Steven Wallis (2007) and finalist Daksha Mistry (2006) help John and Gregg with the judging. Browse content similar to Episode 5. Check below for episodes and series from the same categories and more! Searching for the country's best amateur cook. Ooh! You've got a towel on your head! I have, I'm very hot. Each week, 14 new contestants battle for a place in Friday's quarterfinal. This is a gastronomic triumph. Only the best will make it through to the final challenges. Please, quick, come on, guys. Fire up those ovens, rattle those pans, it's MasterChef time! Let's discover some incredible, creative, culinary talent! These seven passionate home cooks all think they've got what it takes to become MasterChef champion. only three will make it through to Friday's quarterfinal. I'm more excited than I am nervous. I can't wait, I'm absolutely buzzing for it. I really am. because I'm a very leisurely cook. but you just have to go out and go all out. Possibly the start of a great adventure. we are more likely to taste something yummy. with the finest produce from around the world. just one fantastic plate of food. we'll only take four of you through to the next round. choose your ingredients, off you go. pork chops, lamb rump, and pigeon. As well as sea bass, turbot, langoustines, and clams. There is also a range of cheeses, nuts, grains, and pulses. And a variety of fruit and vegetables. and you've only got an hour and ten minutes is daunting. I'm going to cook what I cook on an ordinary day for my family. I think it's about not panicking. This market challenge is a great challenge! Because it allows these contestants to cook whatever they want! They have no restraints at all, apart from time. that belongs together on a plate. I pretty much got an idea straightaway. It's a dish which I make quite a few times so, I've got faith in it. I'm missing something, and I can't work out what it is. You've got one hour and ten minutes, one great plate of food. Best of luck. Let's cook! enjoys cooking with flavours from all over the world. I've got a very, very, varied repertoire. So, I feel relatively confident doing lots of different things. Martin, what are you going to make with all the spice? I'm going to attempt to make my own ras el hanout. it's just a question of getting the blend of the spices right. vanilla cauliflower puree and just a plain grilled aubergine. You're using lots of big flavours, Martin. You must be a very brave, bold cook. You've got to be if you're here, haven't you? and I don't know how I feel about it right now. loves cooking for his wife and two young children. I practise a lot, and you know, you get out what you put in. the reward will be great. should work together. Pork, celeriac, apple, and sage. The pork chop needs to be moist and not dry. so the rind goes crispy. Last thing you need is rubbery skin around the outside of a pork chop. I love cooking and this is what I want to do. anything to do with cooking. -Absolutely. I would love to. It's the dream. At the moment, it's about there, but I'd love a restaurant. Guys, you have 45 minutes left! Sri Lankan born Roma is a novelist and painter. the response that you get is immediate. As a novelist, you wait for criticism. But with food, it's instant. I'm making this dry Sri Lankan aubergine curry. And what spices are you using? Well, I've got fenugreek which is obviously Sri Lankan. And I'm going to go back in and look for turmeric. the main ingredient, in this case being aubergine. but that releases the juice when you eat it. I'm quite excited about Roma's food, really excited. My family are quite meat and two veg, you know? that's not really something that I've really grown up with. In the past five years, I've sort of done quite a bit of travelling. you know, it's been a big inspiration to us in that way. Anthony, forgive me, I can't work out what it is you're making. It's a Syrian-style dish called Muhammara. fresh pomegranate to give it a bit of a kick, and black treacle. -I'm doing it with flatbreads. How did you learn about the street foods of Syria if you weren't there? I visit the Middle East quite a lot. Just because I like the culture. I hope it pulls off. But we'll see. I've eaten food from Lebanon, but I've never had anything from Syria. I'm quite excited about it. than just a dip and a bit of bread. 26-year-old Chloe from Leeds, loves cooking for friends and family. And they're like, "Yep, can I just eat it now?" with a berry and pecan brittle. It's basically a fondant. Just with a melted middle. So it is a fondant, basically. -Yeah. I'm just calling it a molten cake to be fancy. I don't usually do sweet things, so it's quite risky for me. I'm having to wing measurements and things. But you've written out the measurements exactly. -So where's the winging coming from? is very brave, especially without a recipe to hand. She is doing this by memory. If it works, if it's delicious, I'll be really, really impressed. Sweta is originally from North India. on the British anti-war movement. of the most minimalistic things you have in your kitchen. using the most random ingredients. If you're in the middle of a PhD, why are you here on MasterChef? I like taking challenges and I've always loved cooking. so this is my decision. OK. Why this dish out of all the things you could have done? I thought I should make a fish. Pickles, sea bass, couscous and hasselback potatoes. I think there might be too many things on the plate. You have 15 minutes left. 36-year-old Stuart is an internationally renowned cocktail bar tender. I get to travel all over the place and do what I love. I've just got to try not to throw all the stuff around. What made you start cooking in the first place? -got a hunger for it. -What are you making for us now? So, we're doing some pan-fried sea bass. I've added some chilli, some garlic in there. and then some cream which I'm just heating up. And then I've got some toasted pine nuts and pistachios. Sea bass and cream sauce? The cream sauce is a bit of an anomaly as far as I'm concerned. heritage carrots, celeriac puree and a white wine and cream sauce. Where's the fat on the pork chop gone? Your pork chop's a bit dry and a bit over. Put a bit of butter on it. It will love it. and the cream sauce gets fatty as well. Your vegetables are cooked nicely. You fondant potatoes are soft. slightly sharp apple that's going with the pork. I could have done the pork a little bit better. It is like a pressure cooker in there. Very, very tough. fennel and radish, samphire and salsa verde. I've never seen it like it. It defies description. You have been really bold here. the samphire and the salsa verde mixed together. I would order it again. that you've put on there. However, the potato doesn't work with the pickled veg. But I think you are a really interesting cook. I think you've got a good eye for presentation. I was happy with what I made. It tasted good, that's the most important thing for me. Flavours are the ultimate thing, you know? I'm just glad it's over more than pleased. It's nerve-racking to be there. with aubergine fritters on turmeric flavoured rice. The rice is light and fluffy and is nice. but I find it a little greasy. And these frittery things don't taste of very much. more dancey on my palate, and it doesn't quite do that. It hasn't quite romanced me. my act together to cook it properly. garnished with pomegranate seeds and finished with a red wine sauce. but the bits that are cooked are cooked nicely. That little bit of vanilla and the cauliflower, that works together. However, I don't get any caraway at all on your carrots. And what I don't like are the pomegranate seeds across the top. without another injection of flavour going on. Some really work for me, some don't. I'm OK with the vanilla in the cauliflower. that it's almost like an antiseptic mouthwash it's so strong. The time just went so, so quickly. and then it was just such a panic at the end. of Syrian inspired mezze dishes. and a red pepper, pomegranate and walnut Muhammara dip. Anthony, well done, you're through to the next round. but they're all very, very tasty. loads and loads of spice in the background. A bit of chilli heat, but sour and sharp at the same time. I think are really, really lovely. Those tomatoes, of course, are sweet. and then you've got that salty sour preserved lemon on there as well. I'm really taken with this. Well done. that dish. And that I just did something new. I'm just really glad that they liked it. Oh, my God, I'm in shock. and a toasted pistachio, pine nut and cream sauce. It looks burnt to me. Your fish is overcooked and dry. You've got burnt bits of chilli and garlic across the top. Sorry, I don't like it. I like your use of lentils and cavolo nero, black cabbage. I think that's great and you've got good seasoning. Ripped apart in there. I can do better than that. That's probably some of the worst cooking I've done in years. But that's the point of being put on the spot, isn't it? You've got to see your ability to adapt. Last up is marketing account manager Chloe who has made the only dessert. creme fraiche and toasted pecans. You just about had time to melt the sugar for your brittle. But you didn't have time for it to set. No. Another four minutes, maybe it would have been OK.
and gooey and exactly how it should be. That on a first round of MasterChef is not a bad attempt at all. and the sourness of your creme fraiche. It's a decent choice. But we're missing our brittle. It's not quite where it should be. I'm pleased it had a gooey centre. I was pleased with how I acted under pressure. It could have always been better, but, yeah, I'm happy, yeah. John, we've found some more good cooks. some very interesting food and one or two surprising dishes, shall we say. My pick of the day is Anthony. because that dip and bread has to be absolutely extraordinary. -Boy, can he build flavour. got really hot with garlic and then finished with a little bit of chilli. -My pick of the bunch is Sweta. Her fish with the hasselback potatoes was brilliantly done. Showed a good touch and good imagination and a good use of flavours. I tell you what, it might become one of my staples. made a really good chocolate fondant with an oozy centre. And sharp dark berries underneath. the quality of her fondant was enough, I feel. I actually took a dislike to and that was Stuart. and sea bass with some chilli would have been absolutely fantastic. He needs to come back in a couple of years when he has honed some skills. full of flavour and texture and I'm really sorry, it wasn't brilliant. The rice was nicely cooked. I liked the spicing that she had on her curry, but her curry was greasy. I don't think she's a bad cook, I just don't think she's done enough to go through. OK, we've got one more place to give. We've got Mark and we've got Martin. One of those is staying and one of those is going home. I liked Martin's endeavour. I loved the use of all those spices. I think it's really brave, very creative. Too much nutmeg in the cauliflower puree. But apart from that, he managed to conjure up some good flavour. in a very unusual way. classic flavours. Sage, apple, pork. All those things were always going to work together. His issue for me, the big issue was a cream sauce. And the pork was a little bit over. Massively want to go through to the next round. I think I've got it in me to go a lot further. Just fingers crossed, I hope I do. I'll go out thinking I didn't do myself justice. that three of you will be leaving the competition. Along with the good news comes the bad news. Stuart, Roma, I'm sorry, you're both leaving us. ..is Mark. Well done, Mark. Martin, so very sorry. Thanks very much. Oh, the pressure was unbelievable. Very daunting, very intimidating, but would I do it again? Yeah. so I think the pressure got to me. You can look back and go, "There's a million things I should have done." and just did too much. You are going to present your food today to three incredible people. Thomasina Miers and Steven Wallis. You impress them, you will deserve a place in the quarterfinal. Two courses, four plates of each course. One hour and 15 minutes. which means that one of you is going home. pickled and fresh cucumber and a watercress garnish. it's duck for main which is quite heavy. and pak choi and a little bit of chilli. to serve with an otherwise Asian duck? Because the sweetness goes really well with the hoisin sauce and with the duck. but it needed something smooth to go with it. deliver bags and bags of flavour and have real clarity. Her main course, however, I feel has no clarity at all. creamy vegetable with an Asian main course. I want to show that I'm good at cooking both fish and meat. and also getting everything plated in the time. I'm cooking an Assamese prawn curry. And then I'm serving it with steamed rice with ghee. A fresh, crunchy papaya salad and some prawn balls. A kheer is a term used for any milk-based creamy pudding. Goes very well with the spicy curry. -to be a lot more sort of south-east Asian, don't they? because our ancestors came from Thailand. So we have the same produce to be used in our meals. -I'm excited about your food. -Yeah, me too. Me too! we've got some fish sauce as well, some Asian fish sauce. I don't know, I've never had anything like this. Tapioca pudding, sweetened, flavoured with cardamom. Saffron in there as well, nuts across the top. Superb. I want it, though, to be a little firm. Hope it's not wet, wet, wet. Some other '90s pop group will do. But I don't want it wet, wet, wet! so hopefully I can do myself proud, yeah. some braised cabbage, a parsnip puree and red wine and cherry sauce. a lot of work to do for your main course. Why have you given yourself so much to do, Mark? It's MasterChef, John, so this is what I'm here to prove what I'm about. I have just one thing to say. I mean, there was a huge amount of work to do. Poached pear in a frangipane tart with cream? OK. And a toffee sauce? I don't think so. I think a toffee sauce is a sauce too many there. Back in the north-east, people love it. with pickled red cabbage coleslaw and beetroot ketchup. Cheddar cheese on the top and then you grill it. It's from an Italian chef who came here in World War II. Then he opened a restaurant in Linthorpe Road, and that's where it came from. because of course we have a really good brown ale in the north-east. I'm serving it with honeycomb cream. Why wouldn't you do the Syrian food that we fell in love with? but then again I'm a bit of a home bird as well. I just thought I want to have a little taste of the north-east. It'd be wrong not to. Wow. I don't know where to start, I don't know where to finish. It's a chicken burger without a bun. I don't mind telling you right now, John, I want to run away and hide. The dessert, on the other hand, I think could be absolutely lovely. A fondant with brown ale. ale and honeycomb to take away the flavour of my chicken cheese parmo. "making a parmo for MasterChef, that's a bit risky." Making it glamorous, that's going to be a challenge, but it's all about the flavour. That's what I want to get across. otherwise it's not worth bothering. with the flavours coming through. Whatever their cooking, I want the flavours to be there. is the biggest treat on Earth. have got to give, it's an honour. I love it. Sitting down and being fed, what could be better? but don't forget your passion in amongst what you're doing. Don't just cook from your head, cook from your heart as well. Different kinds of menu every time. Fantastic. -Enough time to cook your scallops, isn't it? It's so easy to overcook a scallop. What you really don't want is a hard bullet. but you want caramelisation on the surface area. That's the most important thing, for me. the watercress and the cucumber. I think she's cooked the scallops beautifully. and very tender in the middle. I just feel maybe she could've done a tiny bit better job of seasoning. some lime zest would have given you a richer limey flavour. got a lovely bit of colour, I love the fact she's put butter in there as well. I like it. and there's sharp pickly bits in the cucumber. You've got five minutes, Chloe. It's got shards of chilli, hey, I'm Indian. Give me chilli any day. It's just how she presents the duck. It's got to be elegant. It's got to, like, tempt me in and not be too overwhelming. Two minutes, Chloe. Is the bok choi cooking? Rested as much as it's going to be, yeah. a parsnip puree, pan-fried pak choi and chilli and sesame crisps. She really knows how to plate up food to make it look good. It just invites you in, doesn't it? The duck's cooked pretty well. I mean, I would prefer it slightly under. The bok choi is lovely and al dente. But, I just feel she needs to just swim in her flavours a bit more. I think there's some beautiful textures. lifted the whole sauce, and I think would have been fantastic. My piece of duck that I'm eating is really lovely and tender. and the sweetness of the parsnip. No two ways about it, that girl can cook. I am pleased with what I've served. but given the pressure and the time constraints, yeah, I'm pleased. Yeah, I think I'm on time. I want true Assamy flavours. you don't want to overpower it with spices. -Come on, finish it off. -Yeah, my hands are shaking. the lime, and the sort of fried element versus the curry. So I think this is going to be a real treat. -Dressing with palm sugar, lime, fish sauce and chillies. Let's go. Well done. Well done, well done. some prawn balls and a crunchy bean salad. -I hope you enjoy it. Assame curry is basically very much with the ginger, the garlic. and I think she's overdone it with the salt. For me, this is quite a delicious plate of food. There's real guts in that chilli sauce. lime leaf coming out. This fritter, I think, is delicious. It's tender, and there are, like, lovely morsels of prawn in there. you need some palate cleansing. I like it, I think it's bold, I think it's original. and a burning little bit of chilli heat. and very, very pungent indeed. Some may say that's too salty. I quite like the power of it. because of the saltiness in the sauce. And actually, I'd like those prawns cooked a little less. -15 minutes on your dessert. Kheer is basically a rice pudding. -It's very thick, rich, creamy. Saffron, cardamom, they're just so aromatic those spices. Love the smell of the saffron. Sugar and butter makes fudge! That'll do, won't it? Look at that. rose petals and a pistachio brittle. -I hope you enjoy it. Thank you. The kheer itself is very nice. Normally Indian sweets are very, very sickly sweet. and I love getting those little nuggets of cardamom seed. You know, real sort of bolts of flavour. and not feel ashamed of that. and there's flaked almonds hiding in there which is just lovely. which is actually fudge with pistachio nuts. That was the most intense thing I've done, and it's just the first round. Mark, you've got 15 minutes on your first course. really crispy skin is what I look for on a duck breast. Fondant potatoes, when they're done well, are spectacular. Or is he going to let us down? Go on, son. Are you happy with it all, Mark? At the moment, yeah. Not bad effort I think to try and churn this out. What I'm really excited about is that red wine and cherry sauce. or it might be a bit of a nightmare. braised cabbage, parsnip puree and a red wine and cherry sauce. It could all be delicious, but the visual is not amazing. The meat is, sadly, very overcooked. I definitely don't want to eat that. The cherries are raw, the cabbage is raw. This was just a collection of things that were not brilliantly cooked. and I like the thyme going through the parsnip puree. and that potato is not cooked. He was up against it, and it's shown on this plate. -Yeah, all right. Yeah, looking good. haven't you? It's all about the pastry. Frangipane has to be really set nice, lovely almondy flavour. Is that toffee sauce going to be too sweet? Or is it going to be a dark, rich, slightly burnt caramel? Right, Mark, are you done? toffee sauce and clotted cream. This is completely different from the main course. I'm glad he hasn't put too much on it, because it would have been sickly. It's just a little drizzle. -by the looks of it. Was a bit of a disaster. So I think he's redeemed himself in that respect. it gives it a nice sugary edge. There is no flavour left in the pear. I'm really sad about that. It's all right, I'm here. I don't think it was my best. The timing is such an issue, I had so many things on the go. I hope I've done enough to stay. Do you expect the guests to know what that is? No, but I'll tell them. in Newcastle eating some incredible, like, British street food. and he's just going for something gutsy and fun. -How long do I have left? Oh, it's going on top. Right, OK. I'm dying to know what this chicken style is. -Trying to spread it across, but it's not smooth enough. Now, the back of a spoon, smooth it all over. Do not ruin the elegance of the dish. Didn't know I had elegance. beetroot ketchup. I hope you enjoy it. ..not very inviting to me. He could not have made it look less attractive on the plate if he tried. The chicken's cooked well, it's got a really lovely crispy crumb on it. and the coleslaw is really delicious as well. heaviness of the cheese and the Bechamel sauce. This is the most original plate of food we've had the whole day. You know, who knows, this could be the next big thing. The problem is, it just looks really bad. and the cheesy sauce across the top, it's like a chicken burger. Chocolate fondant. Getting that right is going to be a test. I want it nice and gooey in the middle. and I love the idea of it being mixed with chocolate. And then you've got the honeycomb cream in there as well. So I'm going to make my own little nozzle. -Make your own little nozzle? It's not perfect, but it gives it a bit of a design. That's so clever. You've actually just cut the nozzle yourself. You've got a minute. They've got to get on a plate. Never been so stressed getting four fondants out in my life. Need to get it out, mate. with a black treacle honeycomb cream. It's nice and smoky, so I hope you like it. Sadly, it's cooked all the way through. Fondant has to be oozy, lovely, unctuous. it's too cakey for me. That brown ale in that fondant is great, really bold, dark flavours. so you get those bitter notes of the caramel. but I kind of love what he's done here. It's just balance. Well... There's no liquid in the centre, mate. It's like the parmo, it's got no presentation whatsoever. He said it's about the flavour, and he's right. I'm glad I got to serve a little slice of home. I just hope they like it because these are things which my friends and family eat. Hopefully I've given a good representation of the kind of food that we make. and we had food from the exotic north-east of England. My cook of the day was Chloe. Scallops were cooked beautifully, duck cooked well. and a really clever choice of ingredients. Thomasina and Steven loved Sweta's curry. however that sauce was pungent and strong, and I like that. She's not shy about what she's doing. Because when you get to dessert, and you've got this tapioca pudding. Firm but chilled, flavoured with cardamom and saffron. That's a heady concoction, and it worked for me. That means we've got a discussion now about Mark and Anthony. Mark presented to us food which was classic, really classic. started to appear, and they all just stacked up against each other. The guests in the dining room really enjoyed his dessert. Frangipane and pear, toffee sauce, lovely. Anthony delivered what he wanted to deliver, and this is the issue. Beautiful moist chicken, and then a tonne of Cheddar cheese. It looked shocking, it tasted great. As for the dessert, we were supposed to have a fondant. It should have an oozy, gooey centre. No oozy, gooey centre at all. If I went home now, I'd be quite disappointed. I'd really feel like I'd let my home down, I think. I'm here to prove that I can cook. This is what I want to do and this is what I love. I'd feel devastated if I went home. and that means that one of you is leaving the competition. -and it's got us through. -I honestly didn't think I'd get this far. so a lot of practice is needed. I'm very proud of myself, and ready for the next challenge. cooking for one of the country's top restaurant critics. When I set this challenge, this was what I was hoping for. Seven more amateurs try to prove to judges John Torode and Gregg Wallace that they have the potential to be the 2018 MasterChef champion. This year sees the return of the MasterChef Market, stocked full of the best-quality produce from across the world, including meat, fish, fruit, vegetables, nuts, pulses, grains and dairy. The challenge is to invent and then cook one dish using anything from the market. This time, the featured ingredients include lamb rump, pork chops, pigeon, sea bass, turbot and langoustine. The contestants have an hour and ten minutes to dazzle the judges and prove they are good enough to stay in the competition. After tasting all seven dishes, John and Gregg decide which four cooks are good enough to stay, while three are sent home. 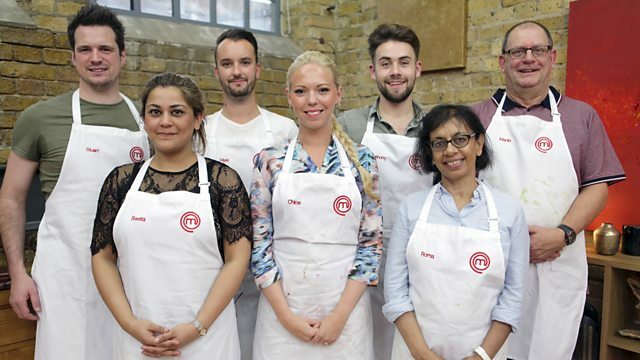 The four remaining cooks now have one more challenge standing between them and a quarter-final place. They must cook an impressive menu that will excite not just John and Gregg but also some very special guests. In this second heat, the contestants must attempt to impress MasterChef champions Thomasina Miers (2005) and Steven Wallis (2007) and finalist Daksha Mistry (2006). After the four hopefuls have cooked, John and Gregg decide who has what it takes to go through to the quarter-final.